Rangers Opening Day at Globe Life Park in Arlington. It should be a national holiday, but I'm not the president of the United States, so it's not. Either way, Opening Day is a really big deal in the sports world and is a part of the fabric of the country. After all, baseball is America's Pastime. 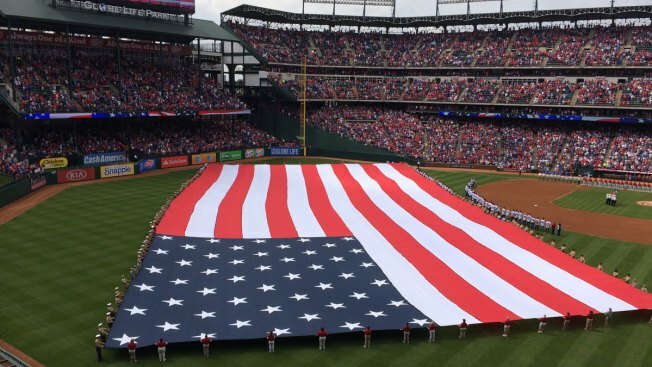 The Rangers announced all of the ceremonial parts of the Opening Day festivities on Monday at Globe Life Park when the Seattle Mariners come to town, and it's sure to be a good ol' time at the ballpark. The game, which has been deemed a "complete sellout" will feature country star Neal McCoy, a constant at Globe Life Park, signing the National Anthem, while WWE's "The Big Show" will deliver the game ball to the mound — all 7-feet, 450 pounds of him. That's if he makes it out alive of Wrestlemania at Jerry World on Sunday. The ceremonial first pitches will be thrown by two former Rangers players who've spent basically their entire lives in the organization. Tom Grieve, the longtime Rangers television announcer and former GM and player, will throw one while Bobby Jones, a former player in the organization as well as coach and current replay coordinator, will throw out the other. Oh, and of course it wouldn't be Opening Day without a loud, bone-rattling flyover done by a squadron of F-16s. Get there early, it's always a zoo. Then, have a blast.